First, see the articles on "Transition Offense" and "Attacking the Full-Court Press". Think of the court in four sections. Full court = "80", 3/4 court = "60", half-court = "40" and 1/4 court = "20". Full court (80): 1-2-1-1 (diamond) press where there is pressure the entire court including on the inbound passer. 3/4 court (60): 2-2-1 press where there is no pressure on the inbound passer. 1/2 court (40): a half-court press such as the Viking 1-2-2 press. 1/4 court (20): this is the defense's usual zone or man-to-man defense. Use this drill progression in teaching these press offenses. See the diagrams below. The defense has pressure on the inbounder in a 1-2-1-1 defense. See our standard positioning in diagram A. O3 is always the inbounder. O1 is up to get the inbounds pass. O2 and O4 are at the sidelines just inside the half-court line. O5 goes long, as in our numbered break. The defense will often try to trap the inbounds pass in the corner. With varsity level players, our first option is to look to make the inbounds pass up the sideline to O2 or O4. If this pass is open and completed, we usually get a 2-on-1 attack fast-break. Otherwise, the pass goes to O1 in the corner, and the opposite half-court player (O4 in the diagram) will move toward the middle looking for the pass. Meanwhile, the ball-side half-court player (O2) moves up the sideline looking for the pass "over the top". O1 looks to pass to either O4 or O2, or if necessary, can pass back to O3, circle back, and then get the pass back from O3. O3 always stays behind the ball for the pass back out of trouble. If O3 gets the pass, then O1 always stays back behind O3. Diagram B, O4 looks to make the pass to O2. O2 has a 2-on-1 situation and looks to attack the basket for a layup, the foul or pass-off to O5. Make sure O5 is on the opposite block. Now look at diagram C. If O1 is being denied the pass, O2 and O4 (after a count of 2) sprint up the sidelines looking for the pass. Once the pass is made to the sideline, O1 cuts hard up the middle expecting the return pass from the side, and O1 can now attack as the press is beaten. Diagram D below shows the rotations that we use if O1 has to reverse the ball back to O3. 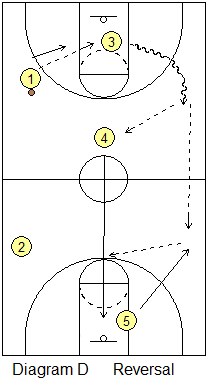 On passing back to O3, O3 then attacks with the left-handed dribble up the left sideline. O4 simply stays in the middle, O1 drops back behind O3 in the middle, in case O3 has to reverse it back to O1. As O3 dribbles up the left sideline O5 pops out to the left wing-sideline area and O3 could pass up the court to O5... if this happens, O4 cuts hard right down the middle for a pass from O5 and a possible layup. O2 stays and could be open for a diagonal pass from O3 (from the left sideline) or O5. See the diagrams below. This is a 3/4 court press with no pressure on the inbounder... a 2-2-1 zone press. Notice that we start with the same positioning setup as in "80". As the ball is passed into O1 on the side, the opposite sideline half-court player (O4 in this case), moves to the "center of the box". The imaginary "box" is formed by the 4 defenders, as if you connected lines from X1 to X2 to X4 to X3 and back to X1. So O4 gets and stays in the center of that box looking for the pass from O1. As the box moves, so does O4, always staying in the middle of the box. Diagram B, O1 can probably start a dribble, but looks to pass to either O4 or O2 (over the top), or could hit O5 deep. O4 looks for O2. Again, once O2 gets the ball, it's a 2-on-1 attack as in "80". Now look at Diagram C. Suppose the defense is denying the pass to O1. O2 and O4 sprint up the sidelines, possibly all the way to the endline. If O2 and O4 are also being denied, after reaching the endline, they backcut and go long for the over the top pass up the sideline. O1 "walks" the two defenders down to the baseline, and then suddenly back-cuts for the over the top inbounds lob pass (red line). O1 will usually receive this pass on the run, in the middle of the court, somewhere around the 3-point arc area. This often works well as the two half-court defenders (denying O2 and O4) sprint up the sidelines to the baseline with O2 and O4, leaving no defenders, no interceptors, above O1. So O1 just seals and cuts beyond the two defenders for the lob pass. Or if the pass goes up the sideline, after walking the two defenders down, O1 cuts hard up the middle and gets the pass from the sideline. With either pass (lob or sideline), once O1 gets the ball, he/she speed dribbles up the court, the press is beaten, and we are looking for a layup. If the defense is in a 61 deny press with two defenders on our point guard (below left), we can run O2 and O4 up the sidelines as seen in the diagram below to get the pass. Instead of O1 cutting up the middle for the pass, O1 stays back and the inbounder O3 cuts up the middle for the pass from the wing. This will work better if O1 takes his/her two defenders down and a little toward the opposite side (to create better spacing for O3's cut). If one of those defenders goes with and denies the pass to O3, we still have O1 back behind the ball in a 1-on-1 situation and he/she can now get the pass and go. Below right is an in-bounds formation that we may use late in the game when the defense is denying and fouling to stop the clock... here we get the ball in-bounds to O2, our best free-throw shooter. O4 and O1 double-screen for O2, who cuts around the screens to get the inbounds pass. After screening, O1 and O4 should seal and roll to open spots as well. Here the defense is pressing just at half-court. A common press is the 1-2-2 (or 3-2). This half-court press-breaker will work against most half-court presses. What the defense is trying to do is force O1 (or a pass) to the sideline just inside half-court where they can easily trap us. They will "invite" the point guard to come across on the side and then trap. See diagram A below for our setup. O5 goes deep, as usual. O2 is up the sideline. O1 brings the ball up and moves to one side to get the defense to commit to him/her. O3 always stays back behind O1 a couple steps, on the opposite side. Once again, O4 moves to the "center of the box" created by X2, X3, X4 and X5 and the pass could go to there. See Diagram B. Our preference is for O1 to move to the side but stop short of half-court, back dribble a couple dribbles and pass quickly over to O3 on the opposite side. With the defense shifted to the right, O3 now dribbles quickly across half-court. Once O5 sees the pass go to O3, he/she cuts out to the 3-point arc to get the next pass from O3. O4 can then cut to the hoop, looking for the pass from O3 and the layup (Diagram C). Now if the defense starts expecting the pass from O1 back to O3 and X3 steps into that passing lane and denies that pass, O4 should be wide open in the middle. It's pretty hard for X3 to cover both our O4 and O3. In summary, the above "80", "60", and "40" press-breakers, along with "3-thru" should take care of any presses that you encounter, as long as you stay calm and are on the attack. We run these press offenses with the thought of not just breaking the press, but to get a 2-on-1 or 3-on-2 advantage and score a lay-up (or get fouled).